The slightly uncomfortable close-ups that dominate Pier Paolo Pasolini’s Vatican-endorsed The Gospel According to St. Matthew place the audience in a position where they’re closer than they might have ever expected to be to the towering Biblical figures that dominate the Passion play. The movie camera has a tendency to make the things it photographs feel genuine, even as common sense keeps one aware of a film’s artifice, but that line blurs often while watching the intricately created world that Pasolini has made here. The entirely unmannered performances (all by non-professional actors, with his mother as the aged Virgin Mary), the seemingly authentic locations (Southern Italy standing in for Jerusalem and Egypt), and the camera setups (which usually take the perspective of a spectator in a crowd when not showing a close-up) all conspire to create a feel that’s closer to documentary that one would think possible given the subject matter. Even the anachronistic music selections, which range from Bach to Billie Holiday fit in here, somehow adding to the movie’s unshakable sense of authenticity. 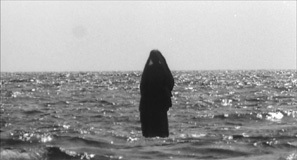 Because of the oddness and uniqueness of the production, the effect of Pasolini’s direction takes a while to take hold, but once it begins to, its power becomes cumulative. By the closing scenes, which show Christ’s crucifixion and resurrection, the filmmaking’s spiritual fervor became deeply affecting, even to a non-believer like myself. 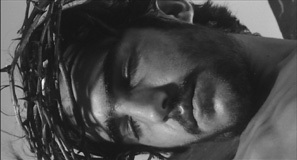 Much of the conviction in the film is undoubtedly centered in the authoritative performance by Enrique Irazoqui as Jesus. A student in architecture school before being discovered by Pasolini, Irazoqui is a commanding screen presence. He embodies the sort of certainty, charisma, and devotion that great leaders must have. To Pasolini, it’s of utmost importance that the audience understands Christ’s ability to sway people to his cause. When combined with the scenes showing the machinations of those who conspire against the Son of God, this knowing attitude politicizes the movie. That this is the tale of a martyr who’s self-aware in a both political and spiritual sense seems to be what fuels the politically aware Pasolini’s interest here, despite the rather reactionary traditionalism that marks the film otherwise. Another possible reason that Pasolini might have chosen to make an honest dramatization of Biblical text is to make that shopworn text come alive for audiences, perhaps inspiring people to think about it in a fresh light. Because scripture, almost by definition is something that’s static, and because film is something inherently dynamic, seeing a familiar, almost inborn, story invigorated as it is here is a near-religious experience in itself. The bliss is interrupted sometimes by some of the sloppy editorial choices that Pasolini makes (a constant bane in his work), but it does little to dissipate the almost tangible power that exists in The Gospel According to St. Matthew.